The jury in the trial at Minshull St. Crown Court of David Swindells junior, the visiting site supervisor for 3D Scaffolding Ltd (Steven Burke's employer,) on one charge under Section 7(1) of the Health & Safety at Work etc Act 1974, this morning returned a verdict of guilty. In other words he has been found guilty of failing to take reasonable care of others in the way he supervised the construction of the bird cage scaffolding at Davy Hulme waste water treatment plant.. The court heard how the work on birdcage scaffolding failed to comply with the industry standard SG4, in terms of its actual construction –no intermediate transoms, inadequate boarding, lack of guard rails and ladders-; the make up of the gang of workers was inadequate as far as competence and supervision of Steven who was only 17, and other inadequacies relating to provision, use and inspection of fall arrest equipment – harnesses. Despite a HSE Prohibition Notice on 16th January 2003, two weeks before Stevens’ death, making it clear what had to be done to ensure safety by compliance with industry standard SG4, almost nothing was done to rectify the appalling catalogue of errors. The other defendants who have all pleaded guilty are Mowlem PLC - the principal contractor on the project- facing one charge under section 3(1) of the Health & Safety at Work etc Act 1974; 3D Scaffolding Ltd, facing charges under Section 2 of the HASAWA 1974, and RAM Services Ltd facing charges under Section 3 of the HASAWA 1974. Sentencing will be on 4th and 5th of February 2008, over 4 years after Steven was killed. FACK, Families Against Corporate Killers (1), support the Burke family’s fight for justice and also for deterrent penalties to make other construction employers think twice before they take risks with workers lives: FACK Spokesperson Hilda Palmer said: “Steven was two young to die but like other young workers was especially at risk (2). Killing young workers through lack of supervision or other negligence is totally and utterly unacceptable and we need employers to act now to stop these totally preventable deaths, and courts to hand out penalties that make them do so. Deaths in construction for 2005/06 are up 28 per cent on the year before, the majority of these deaths are not accidents but due to employers failing to manage health and safety and/or flouting the law. Workers will only be safe on sites when employers comply with the law, co-operate with workers and trade unions; and when the HSE enforces the law strictly coupled with courts punishing criminal employers when they don't comply." There is evidence work is becoming more hazardous for young workers. 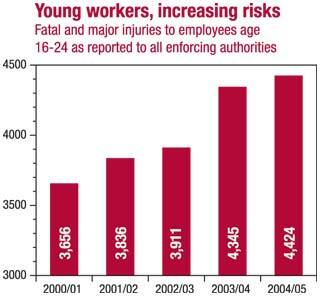 The combined total for "fatal and major injuries" in 16-24 year old employees has trended upwards in recent years. The figure is higher now than at any time in the last ten years, and has increased year on year for each of the last five years. 3. The inquest heard from HSE Inspector, Mr Nicholas Rigby, that the scaffolding was almost completed up to roof level but there were errors in the method of construction of the scaffolding, which did not meet expected industry standards approved by the HSE. These included failure to complete platforms and secure ladders on the way up, lack of guardrails and toe-boards. There were also issues about inadequate safety harnesses and the man in charge of the job was no more qualified than Steven. This led to Steven and the worker in charge of the team climbing back down scaffolding poles rather than a ladder, to carry out a task that shouldn’t have been necessary had the scaffolding been built in the proper manner and to the industry standard. In the opinion of a HSE scaffolding expert, there were 2,500 too few scaffolding poles used and many less boards than necessary. The Inquest verdict was accidental death. No manslaughter charges were brought. H&S Prosecution on 6th November 2007.